The Coffee Maven never misses the Celebration of Coffee! I had the great pleasure to be part of the 4th Annual Celebration of Coffee in Worcester, this time in its new venue at the Worcester Public Library. 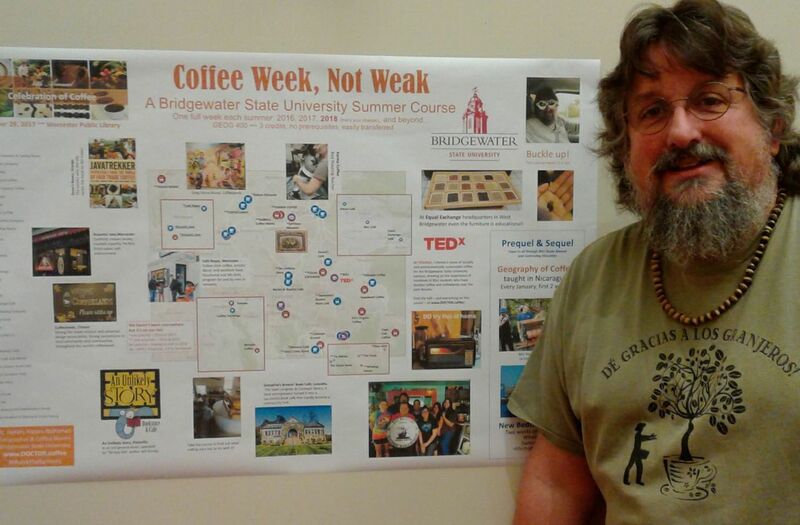 I took the opportunity to let people know about my summer course, Coffee Week, which I will be offering for the third time in 2018. I initially intended to use the extended class time (five, 8-hour days) to show some coffee-related films, with one day to travel to some special roasters and cafes in our area. I quickly realized that the opposite ratio is best. This class meets mainly in a van! In one corner of the poster, I included my "prequel" and "sequel" courses: Geography of Coffee in Nicaragua and New Bedford Fortnight. 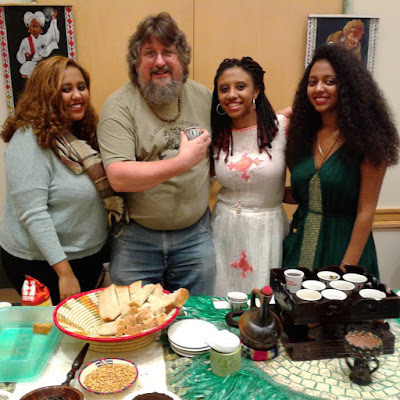 As part of the Celebration, Quinsigamond students from Addis Ababa shared the famous coffee-serving rituals of Ethiopia (to the extent possible in a public place with smoke detectors: the did pre-roast the coffee and limited their use of incense). The experience makes me even more interested in including Ethiopia in my 2019 sabbatical travels. Meanwhile, they gave me the gift of a genuine Ethiopian coffee cup. Best of all, at least one of these students is planning to take a BSU coffee course or two. I love to have people with coffee expertise in these classes. The event included a lot of other excellent participants. One woman shared Eritrean coffee traditions (similar to those of next-door Ethiopia) and let me know that Eritrean coffee is available both roasted and green in Boston-area markets. Community educators from Worcester State University shared coffee from Panama, Puerto Rico, and the Dominican Republic. Our friends at Café Reyes, Acoustic Java, and Equal Exchange -- all part of my Coffee Week course -- were all represented as well.